I’ve been a fan of Kelly Bowen for a while but honestly the first book in this series was just ok for me and it didn’t leave me rushing to pick up this next one. I should’ve known better! 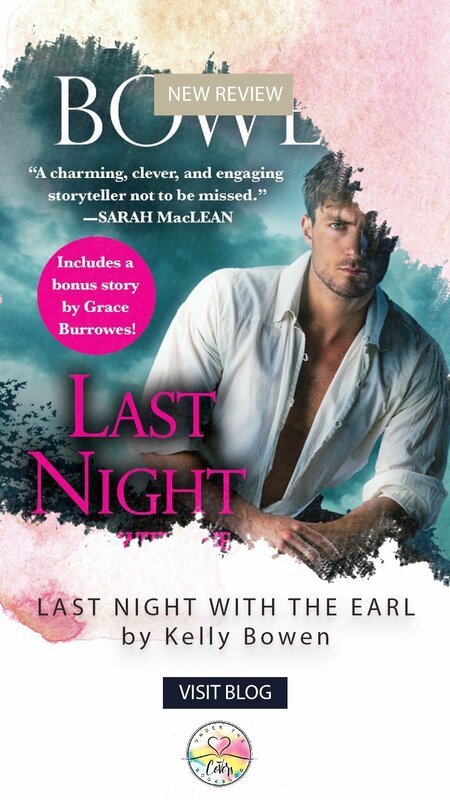 LAST NIGHT WITH THE EARL is about a scarred hero who comes back from war after everyone believes him dead and he gets a chance to get the girl he was in love with before leaving who was engaged to his best friend. I couldn’t put this book down! Rose is working with her sister at her Haverhall School for Young Ladies teaching about her passion, art. I love the concept of the School and the siblings this series revolves around and was very interested to see Eli’s reaction to what was going on at his house. But he fit perfectly well! The chemistry between Rose and Eli is palpable from the very first encounter in this book where she threatens him with a paintbrush. I adored the back and forth, the teasing, the sparks, the sexual tension! They were addicting for me. I’m a fan of strong female leads in historical romance and while Rose had things to fight through, she came out in the end stronger for it. All that being said, I know the next book will be excellent and full of danger so I can’t wait! If you aren’t reading Kelly Bowen you may want to rectify that immediately. I agree that the first book was just ok but am glad this story is much better since I liked rose and was interested in this story since the end of book 1. I’ll be adding this to my wishlist, book 1 took me a while to get into.